Discussion in 'Microsoft Surface Book' started by rolldog, Jan 6, 2018. I just wanted to share this with everyone, since I've seen so many people complaining about being able to run an external monitor, running down the battery while being plugged into Microsoft's dock, etc. 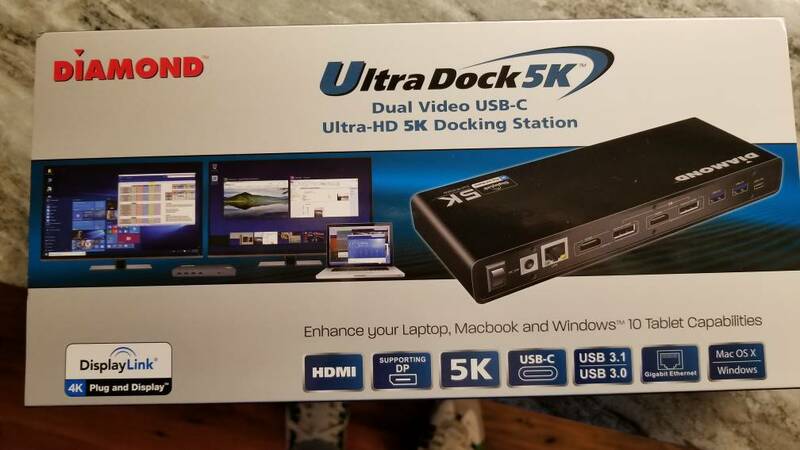 I just got this dock in from Amazon, it connects to the USB type C port and has USB 3.1 & 3.0 ports, 2 x 4K HDMI ports, 2 x 4K Display ports, all ports run at 60hz, 1 x Gigabit Ethernet Port, plus a few other connectors. I haven't had time to test everything out yet except the Ethernet port, which supports IPv6 & IPv6, and running an external monitor at 4K (this dock supports up to 5K), but so far, everything seems to be working fine. Now, I haven't tested dual monitors yet, but it says it supports it. Just thought I would share. Cuchulainn, KamaL, jnjroach and 1 other person like this. What are your impressions so far?? @rolldog This looks really intriguing. Please do keep us updated.